Mushroom 11 is a very different type of post-apocalyptic game. Instead of a human fighting zombies and looking for supplies, you play a green blob. Developer Itay Keren showed me some of the game and talked about the concept of playing a blob. The idea for Mushroom 11 came from a game jam with the theme "ouroboros" - the snake eating its own tail. That led to the idea of destroying yourself to make progress, which is what you'll see in the video above. The green blob you play is made up of cells — 132 of them — and you interact with it by erasing chunks of the blob. As you erase cells from one side, they regrow on the other side, allowing your blob to change shape and roll around the map. As you progress through the game, you'll have to learn to navigate the world, crossing lava pits, gaps, and climbing walls using this odd mechanic of destroying yourself to move. One section requires you to use a beam as a bridge, but you need something to hold in place. Eventually you realize that you can split your blob in two, allowing one piece to hold the beam in place, and let the other half move on. The developer explained that this is the basic idea of the game: learning that you have to make sacrifices for the greater good. Take a look at the video for more on the game, where the idea came from, and what the story of the destroyed world is. 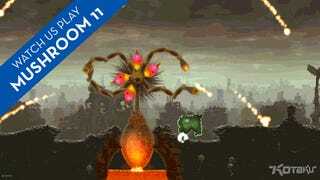 Mushroom 11 is planned for release toward the end of 2014 on PC, Mac and Linux, and hopefully for handhelds later. Follow the game at @untamegames and untame.com.